An entertaining little platformer that is accessible for young gamers of all skill (and reading) levels. Not much of a story line to speak of. 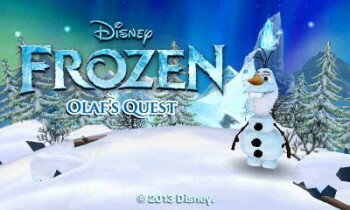 Disney Frozen: Olaf’s Quest takes the endearing little snowman from Frozen and sets him off on an adventure of his own. With relatively short levels, no reading necessary, and a forgiving structure, it’s a great choice for the young gamers on your list. As you might have guessed, Disney Frozen: Olaf’s Quest features a character from the newest Disney offering, Frozen. Olaf is a cute and quirky little snowman who plays a big part in the film, which releases in theaters later this week. Whether you’ll be in the theater on opening night, or hanging in there for the DVD release, you can get a little Frozen right away with this cute little 3Ds title. 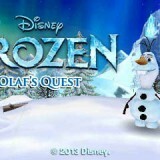 Rather than using the story line from the film, Olaf’s Quest picks up Olaf’s story after the film. The story is minimal, and told entirely in postcards depicting Olaf in various locations. No reading is needed (nice for younger gamers), but don’t expect a whole lot in the way of entertaining story line either. 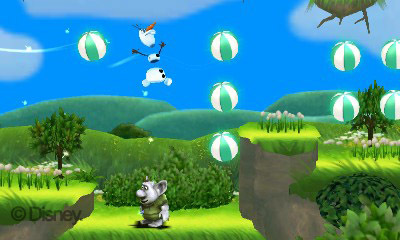 Olaf’s Quest is basically a simple platformer that takes a page from standard mobile game format. 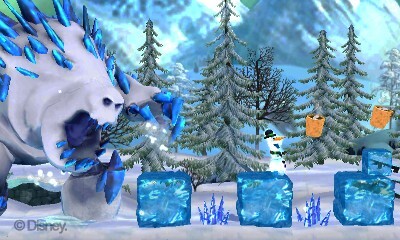 Players work their way through a variety of fairly short levels. It’s both accessible for kids at all skill levels, but challenging enough for mini game pros. It does this by adopting a three stars scoring for each level. You get one star for finishing the level, one for picking up all three flowers, and a third star for picking up all the extra items in the level. These extra items vary from environment to environment. In the first levels, they are snowflakes. In later levels, they are things like carrots, beach balls, and even cups of hot cocoa. They match up somewhat to the environment Olaf is currently in – for instance, iced tea for summer. Whatever the extra item happens to be for that level, you’ll be given the number hidden in each level, and you’ll need to collect every single one if you want to get all three stars. Since it is a game meant for children, it was nice to see that it does not penalize for failing to get a perfect on every level. While your little completionist will likely want to go back and redo the levels till they get every star possible, their little brother can happily keep playing without getting frustrated. The play is pretty simple. Olaf, being a snowman, doesn’t have a whole lot of tricks at his disposal. He can throw his head up in the air, which is useful to hit both hard to collect items and pesky wolves. He can jump, and once he’s up in the air he can glide a bit with his propellor hat. That’s about it. There are different environment features that can be interacted with later in the game (like ice slides and breakable blocks) but they use the same mechanics of jump and throw, so as long as your kid can manage the “A” and “B” buttons they should be able to play just fine. 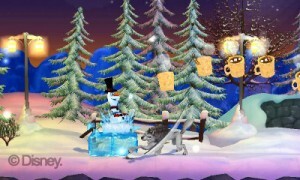 For the most parts, the levels play out like any platformer – you jump around, collecting items and avoiding obstacles like thorns and spiky icicles. You can go back and forth as much as you need to in the level, you can’t really die, and you aren’t timed, which should really cut down on frustration in young and rookie gamers. The exception to this is a few levels where you are essentially chased through. On these, the game continuously scrolls through as you try to collect as many items as you can, while you are chased by things like a moose or a giant. They aren’t particularly difficult (especially if you aren’t worried about collecting every item), but the element of rushing does make it a bit more stressful than the other levels.